I learned how to make Fathers Day food when I was very young and found that good food was the best way to Dad's heart. For the most part, it is a matter of personal preference of what your dad likes to eat. Some dads do like to grill out which they do often. Other dads feel obligated to do the work if the family decides to cook out. For this reason I usually learned how to make new Fathers Day food each year to serve in my dining room or at Mom and Dads. Nothing ever pleased my dad or my husband any more than a delicious home cooked meal. To make the day special I would put a nice tablecloth on the dining room table and set the table with my good china and utensils; despite what they say, men do love the special attention. Learning how to make Fathers Day food to serve around the table with the family is a very important part of this special day; and I did say special day. Like Mother’s Day, I feel this is a day to be celebrated; fathers are very important to the children and to the family. Although it is important for good fathers (and mothers) to work to provide the necessities of life for the children it is not necessary to be able to give them all that they want. Believe me, I have seen through my life that that is not good for them; today the children are just given way too much. What they need is the time, attention and discipline. Before I go on with some of my Fathers Day food ideas, I would like to share a little about my father; or tribute to my father. I must first say every year that I get older, the more I appreciate the one I had; this did not happen overnight. 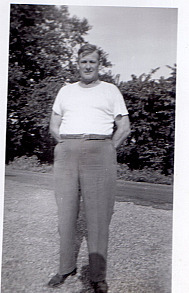 Dad was forty seven years old when I was born and I was the fifteenth child; right there began a generation gap. My earliest memories of Dad as a child was when he would take me with him to gather sassafras tea bark and coming home to make it; I loved that. Sometimes he would take me to the old bottle farm in Germantown, Ohio; that was fun also. I remember our strawberry patch and our get togethers; all where Dad was. I never feared anyone ever hurting me because I knew Dad would not allow it; these were all good. Then I became a teenager and wanted to do what the other teenagers were doing. Suddenly Dad became OLD! I quit talking to Dad; Mom was the buffer. Dad was retired now so if I wanted to go someplace and wanted him to drive my friends and me, I asked Mom to ask him; and he always did. I still remember when we would celebrate with Fathers Day food, I still remember all our family gatherings and Dad was always there but I quit having any father daughter relationship with him. The only time was when I wanted him to do something for me. My friends got to think of him as a mean old man although they never said anything to me at the time. I still felt safe and secure having him in our home; no one would cross me. As soon as I graduated from high school, suddenly Dad changed again. It was like a weight came off of him having me grown; being the last after so many. It is funny now how Dad ruled our home with an “iron fist” and the grandchildren were a whole different story; they could do no wrong. After raising my four children I completely appreciate my Dad. I am so grateful that I once again I had the years to share with him the good father daughter relationship before his passing. Now as I celebrate with Fathers Day food or any time I cook I think of Dad. He was a good cook and loved good food; especially our wonderful traditional German recipes; noodles, dumplings, pork and desserts. My point of sharing is to let you know it is not easy being a good dad but it leaves a lasting impression forever. This large recipe makes a great Fathers day food or for other special days when you gather together. Combine the egg yolks, milk and sweet potatoes; add to the flour mixture stirring just to moisten. Stir in the melted butter and pecans; set aside. Beat egg whites at high speed until stiff peaks form; fold into the batter. 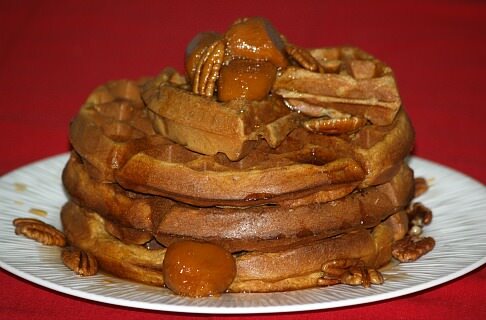 Bake in a preheated oiled waffle iron until crisp (About 6-7 minutes each); keep warm. NOTE: I use a full ½ cup of batter for each 6 inch waffle. 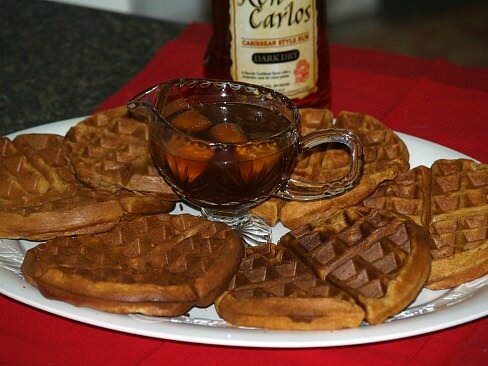 Serve with following butter rum syrup; makes 9 six inch waffles. Garnish with hot sweet potato pieces and pecan halves. HEAT to a simmer; simmer 5 minutes and serve hot over waffles. Combine carrots, water and bouillon cube; bring to a boil. Cover, reduce heat and simmer until carrots are crisp tender; drain. Sauté green onions in butter in skillet until tender; set off heat. Add cheese, sour cream and milk and blend well; stir in sliced carrots. Spoon into a greased 2 quart casserole baking dish; sprinkle with breadcrumbs and parsley. Bake at 350F degrees for 20 minutes or until thoroughly hot. Combine oil, mustard, thyme, rosemary and parsley; score roast and rub seasoning in roast. Wrap roast in foil and refrigerate overnight. Place roast fat side up in shallow pan and place on oven rack. Insert meat thermometer into thickest part of roast making sure it does not touch fat. 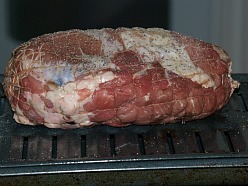 Bake uncovered at 325F degrees until thermometer reaches 160F degrees (about 2 to 2 ½ hours) basting frequently with wine. Let stand 15 minutes before slicing. My sister makes this recipe quite often. It is very easy to make and very delicious; taste like the cream sickle that I use to love as a kid. When Donna makes this she uses sugar free gelatin, pudding and orange soda.This is a great Fathers Day Food. Bake according to package directions baking in 9 X 13 inch baking pan. After cake has cooled, poke holes all over top with a fork. Mix gelatin with 1 cup boiling water stirring until dissolved; add cold orange soda and blend. Pour soda/gelatin mixture over cake. Mix pudding with 2 cups cold milk and stir until thickened. Mix pudding with Kool Whip until blended; spread over cake. Preheat oven to 350F degrees; butter casserole baking dish. Put in a layer of potatoes, a thin layer of cheese and then white sauce. Place buttered crumbs on top and bake until brown on top and thoroughly heated. Melt butter, add flour and mix in salt; stir until blended. Add milk gradually stirring constantly bring to a boil until thickened.